On June 3, the Mingyang Longyuan concise and integrated type high-voltage converters will be duly consigned to Shiheng Power Plant of Shandong Zhonghua Electricity Generating Co., Ltd. 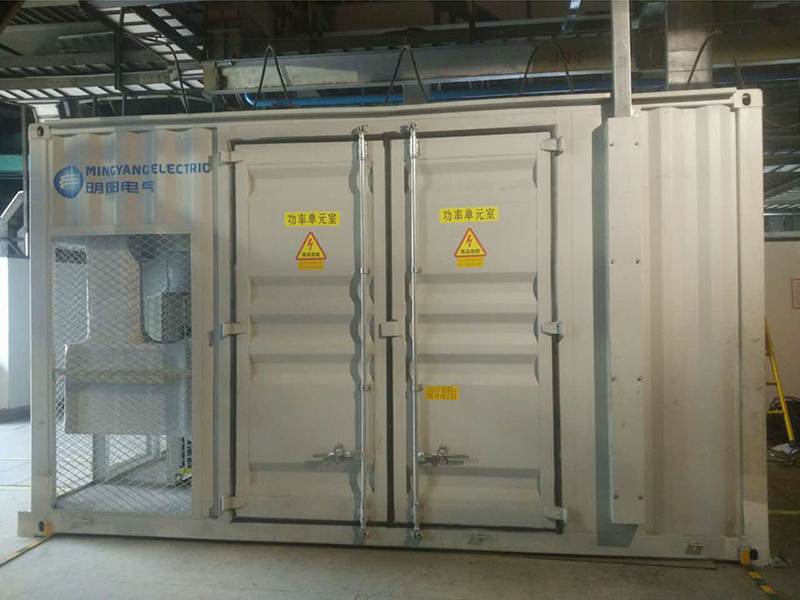 This is the first project which is put into service for the concise and integrated type high-voltage inverters manufactured by Mingyang Longyuan. In this project, what the customer purchases is the concise and integrated type high-voltage inverter, however, he obtains the integrated solutions of one-station high-voltage inverters meeting the customers’ requirements initiated by Mingyang Longyuan. The product program of the concise and integrated type high-voltage inverter covers the 6kV series and the 10kV series, with the rated capacity range of 200kVA to 9500kVA, and it has the most advanced control method and technology. By adopting the highly integrated scientific design of the concise and integrated type high-voltage inverter, the inverter control, the bypass, the main circuit and the radiating and cooling system are reasonably designed in the integrated case. A user is only required to connect the input and output power cables as well as the remote control cables so as to directly drive the high-voltage motor. It enables the products being subjected to coordination of multiple complicated work types as well as many days of construction for commissioning to become an extremely simple integrated solution, which reaches perfection of simple engineering and construction. The concise and integrated type high-voltage inverter has a high level of protection, and it can be directly used outdoors, which saves the use space by about 40%; its transportation, storage and on-site installation can be completed in a one-station manner, which saves the time limit of a project by around 75%; and it can also help the owners to reduce the overall investment of the project, which has high profitability. By taking the inverter with voltage of 6kV and the rated capacity of 1000kVA as an example, the concise and integrated type high-voltage inverter can help the owner to reduce the overall investment by more than 20%. Mingyang Longyuan develops a high-voltage inverter cloud platform to realize remote real-time frequency-conversion data acquisition. By adopting this platform, not only the owner can on-line check the operation status and operation data information of the inverter, our plant can also realize remote and intelligent operation and maintenance. For example: high-efficient avoidance of risks by analyzing operation data of the inverter; analysis and resolution for fault information of the inverter; and inverter maintenance through remote guidance to the owner or the service personnel. The successful commissioning of the Mingyang Longyuan concise and integrated high-voltage inverter creates a new record of the industry, it also brings unprecedented brand-new experience in energy conservation and emission reduction, and it makes great contributions to create more perfect products for society.